The Audi Q5 offers seamless technology, full LED headlights and a luxury body style. Visit Audi South Burlington today. 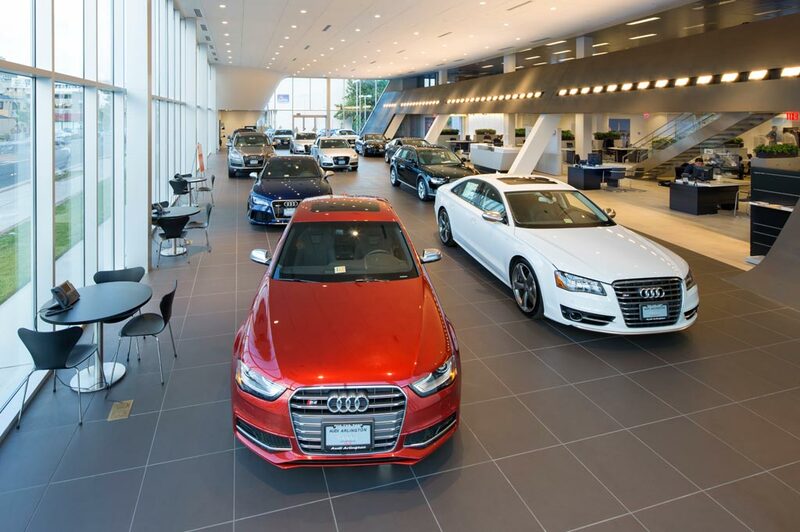 Audi South Burlington in South Burlington, VT treats the needs of each individual customer with paramount concern. We know that you have high expectations, and as a car dealer we enjoy the challenge of meeting and exceeding those standards each and every time. Allow us to demonstrate our commitment to excellence! Our experienced sales staff is eager to share its knowledge and enthusiasm with you. We encourage you to browse our online inventory, schedule a test drive and investigate financing options. You can also request more information about a vehicle using our online form or by calling (802) 861-3010. Welcome to our website at Audi South Burlington! We're so excited that you've stopped by today to learn more about what we have to offer as your Audi dealership serving the areas of South Burlington, Burlington, and Essex Junction. As a proud full-service dealership, we go above and beyond to see your buying experience through from beginning to end and work hard to make sure you enjoy every minute of it. Keep reading to learn more about how we do that with our expansive inventory, our friendly finance team, and our on-site service center! In our showroom and on our lot, you'll find an expansive and varied selection of vehicles both new and pre-owned. We strive to keep our inventory at full capacity so that our customers have the selection they need to find the perfect vehicle for their needs. At our dealership, you'll find all the newest Audi models available including the A3, A3 e-tron, A4, A5, A6, A7, A8, A8L, Q3, Q5, Q7, S3, S4, S5, RS5, S6, S7, RS7, S8, SQ5, TT, TTS, and more. Not only do we carry just about every new Audi model available, we also carry a wide variety of trim levels and available packages. No matter what you're looking for in your next new Audi vehicle, we're confident that we have it in our inventory. In addition to the many new Audi vehicles that we have to offer, we also have an impressive selection of quality pre-owned vehicles for our customers to choose from. Whether you're looking for a gently used pre-owned car or a like-new certified pre-owned Audi vehicle, you'll be able to find a vehicle that fits your needs in our lot. Once you have your next Audi vehicle picked out, it's time to think about how you're going to pay for it. Thankfully, you won't have to take on this leg of the buying process alone. Our finance team will sit down with you to go over your budget, lifestyle, and credit score. Armed with this information, our finance team will be able to go out and find an Audi lease or car loan that you feel confident about. We know how much you care about and rely on your Audi vehicle. That's why we make it easy to keep it in the same great condition with our convenient, on-site service center. Here, you'll find a team of expertly trained service technicians that can handle any service needs you have. From simple oil changes to unexpected repairs, you can count on them to get the job done quickly and correctly. Even if you prefer to do your own maintenance, we have what you need. Order all the parts you need for your next DIY maintenance or repair project right from our parts department. We at Audi South Burlington are thrilled that you stopped by our website today to learn more about who we are and what we're proud to do for shoppers in the areas of South Burlington, Burlington, and Essex Junction. Get the ball rolling on finding your next new or used Audi vehicle with us today by browsing our updated inventory right on our website. When you find something you could see yourself in, give us a call and we'll get you scheduled for a test drive!